SRATI established a unique plumbing lab, with built - up area of 4150 Sq.ft. as per Uniform Plumbing Code India – 2008. It is the first of its kind in India, constructed to International standards has different types of plumbing fixtures of leading Indian brands and many International brands from USA, Germany and Thailand. Imparting plumbing training in live plumbing stack (transparent display) system. International Association of Plumbing and Mechanical Officials – India (IAPMO) and Indian Plumbing Association have recognized SRATI as an Accredited Training Institution for Plumbing Education to Employment Program in India. 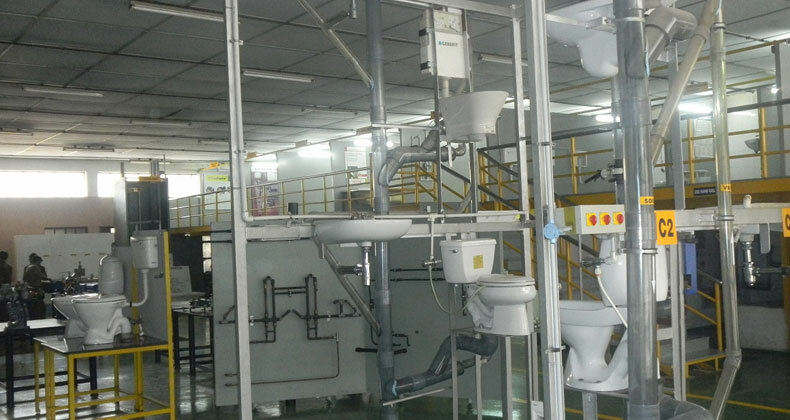 The lab was designed and developed with the guidance of Indian Plumbing Association and Indian Institute of Plumbing. We also conduct custom designed Welding and Plumbing courses as per customers’ requirement.